Viewing topic "Selling on this forum"
Can we sell audio hardware on this forum? Synth etc. Good question. I’ve seen indirect posts in the past but never been clear understanding by me. I’d be interested to know the rules on this, too. I wondered if people could advertise Motif series boards they have to sell. Our policy with regards to selling on the forums is that we don’t allow commercial advertising, which mainly applies to sound / content libraries (posts advertising trainers or toner cartridges get removed as swiftly as we can, too). It’s harder to pirate a fully formed Motif. In the past people have posted instruments for sale and we have no real policy against that. The only caveat is caveat emptor (and venditor) since we don’t offer any form of escrow or broker service. We have considered setting something up like this but we’ve not progressed beyond the considering stage. This item is being sold privately through ebay/reverb/gumtree. 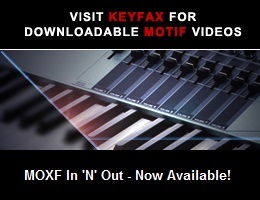 Motifator.com/Keyfax are not responsible or liable for it, or anything resulting from it. Thank you to MrMotif for allowing me advertise it. I don’t think it’s great news yet, or at least until the Dominus de Motifator says that it can happen.